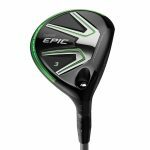 CARLSBAD, Calif., January 4, 2017 — Callaway Golf Company today introduced Great Big Bertha Epic fairway woods, which incorporate Callaway’s revolutionary and proprietary triaxial carbon composite material to enhance forgiveness, power and accuracy. Epic fairway woods employ a triaxial carbon crown that weighs just 5.8g, making it an incredible 78 percent lighter than a steel fairway wood crown. The saved weight is redistributed into strategic locations within the head to dramatically increase MOI and lower the CG, making Epic fairway woods extraordinarily easy to launch. Distance is enhanced by the fourth generation of Callaway’s proven Hyper Speed Face Cup technology. In this generation, the thin and flexible rim around the inner side of the face flexes and releases more uniformly and efficiently at impact to increase ball speed across the face, especially toward the bottom. Distance is further boosted by Callaway’s proven Speed Step technology. Designed with the help of aerospace experts, the Speed Step, located on the crown, improves the head’s aerodynamics to promote more speed. GBB Epic fairway woods are offered in five lofts — 3+, 3, 5, 7, 9, Heavenwood. GBB Epic fairway wood availability begins January 27 at a manufacturer’s suggested retail price of $279 per club. There will also be a GBB Epic Sub Zero line fairway woods available in 13.5- degree, 15-degree and 18-degree lofts. This Epic Sub Zero model features adjustable weight screws for lower spin capability.